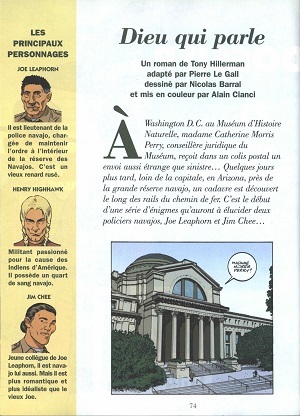 This is an excerpt of a cartoon adaptation of Tony Hillerman's Talking God, published by Bayard Presse Jeune in the magazine Je Bouquine. The magazine is for young readers, age 10 to 15 years old. The story excerpt was adapted by Pierre Le Gall and designed by Nicolas Barral and Alain Cianci. Following the cartoon excerpt is a 3 page biography of Tony Hillerman, a one page excerpt from the Rivages/Noir French edition of Talking God, a short chronology of Hillerman's works and a quote by Tony Hillerman. Format: Paperback, 24.5 x 18 cm.